Who else wants curls as flawless as @nchanel? Click the image to get these curl nourishing stylers and more today! Honey & Shea Edge Tamer - Every curl girl loves a reliable edge tamer. With Design Essentials Honey & Shea Edge Tamer your curls will stay in place while gaining nourishing benefits of honey and softening properties of shea. 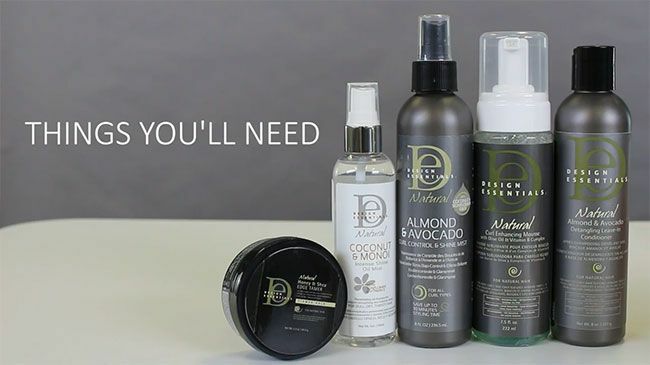 Coconut & Monoi Intensive Shine Oil Mist and Almond & Avocado Curl Control and Shine Mist - All looks that follow in this post require a finisher that imparts moisture and shine. Reach for these shine oil mists to get both! Curl Enhancing Mousse - No matter how hard we try, curlies eventually have a battle with frizz. To keep those unwelcome curl enemies at bay, grab this curl enhancing mousse when setting your perm rods. Almond & Avocado Detangling Leave-In Conditioner - We all know that leave-ins tend to be the super stars of the natural hair community. That's why you'll love that this one offers your curls a serious helping of almond and avocado, both moisture-rich ingredients that help soften and strengthen curls. Watch the video tutorial to learn how Nikki got the most ravishing curls of the season with Design Essentials curl nourishers and a set of orange perm rods! Get the OOMPH Factor: Looks that Turn Heads! Work that manageable softness and shine, curly! Complement your curls with a super cute bomber jacket, face framing turtleneck, and high quality accessories that steal the show! The perfect casual Fall/Winter look! Pin-up those curls for an edgy, fun 'hawk! Nothing says "I'm ready for my close up" like a suede jacket, classy plaids, and a pair of sharp and shiny Oxfords. Those curls and that style will get you far, ladies. Look 3 - Fancy Side Bun for the Win! For extra shine, reach for Design Essentials every time! Big comfy coats and floor length dresses are this season's go-to styling options for curly girls that love being the center of the attention! Let the compliments flow with this elegant look. There's no stopping your perfectly style perm rod-out and your swag with this season's most stunning looks. Like this Lookbook by NaturallyCurly and Design Essentials? Tell us how much in the comments section below. Remember to subscribe to NaturallyCurly on YouTube to see more super cool videos and tutorials from Nikki Chanel and our editors. And don't forget to share your favorite looks with your curl friends today!